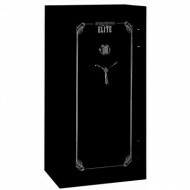 Stack-On gun safes ETL fire ratings are based on various factors: The entire safe is insulated and in addition the reinforced steel doors are fiiled with fire retardant material. 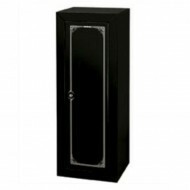 These Stack-On gun safe also include door stripping which expands when exposed to high temperatures - sealing contents from harm during a fire. The fire protection is only one great feature of the Stack-On gun safes. Besides its steel construction, there are 7 live locking bolts and 3 dead bolts....a total of 10 bolts protecting your safe from break-in. 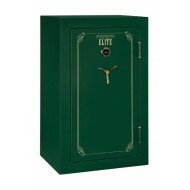 For great security and great fire protection, look to Stack-On gun safes. If you need indoor delivery for this 141lb safe, please call 1-877-442-9964. There is an extra charge. Use this versatile Stack-On gun safe for 31 long guns or configure shelves to hold pistols or other important items. 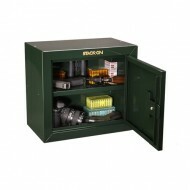 This Stack-On gun safe has the approval of the California Department of Justice for the secure storage of firearms. One side of the gun safe is prepared to hold barrel rests (extra barrel rests included). This same side of the gun safe has padded sides and bottoms to reduce scratching. 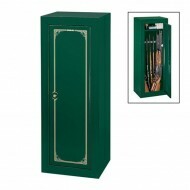 The Stack-On GCG-190 gun safe holds 10 rifles or shotguns up to 52" tall. A removable shelf is included with the gun safe. Th shelf is positioned in the back of the cabinet so longer guns can be stored in the front along the side walls. A foam padded bottom and barrel rests reduce scratches. 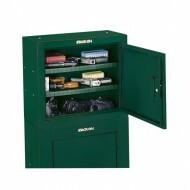 This Stack-On gun safe has the security features of a 3-point locking system with a double bitted key lock. 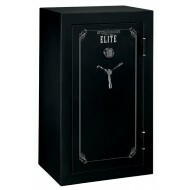 These and other security features have gained this gun safe a rating as California approved firearms safety device. Its attractive gloss black exterior has chrome accents. The interior includes a foam padded bottom, barrel rests and one removable shelf. This small pistol safe has security features such as a two-bitted key lock and a locking mechanism which passes through the steel door and is secured behind the steel door frame. This stack on pistol safe earned the security rating from the California Department of Justice for safe storage of firearms. This GCG-900 pistol safe can fit on top of all standard pre-assembled Security Plus Gun Safes. Pre-drilled mounting holes allow for easy attachment to floor, ceiling, wall or other Stack-On pre-assembled gun cabinets. Not recommended for use with Stack-On 10 Gun Safes or 8 Gun ready to assemble safe. The GC-500 would be a better fit for the dimensions of these small gun safes. This small pistol safe has security features such as a two-bitted key lock and a locking mechanism which passes through the steel door and is secured behind the steel door frame. This stack on pistol safe earned the security rating from the California Department of Justice for safe storage of firearms. This GCB-900 pistol safe can fit on top of all standard pre-assembled Security Plus Gun Safes. Pre-drilled mounting holes allow for easy attachment to floor, ceiling, wall or other Stack-On pre-assembled gun cabinets. Not recommended for use with Stack-On 10 Gun Safes or 8 Gun ready-to-assemble safe. The GC-500 would be a better fit for the dimensions of these small gun safes. This small pistol safe has security features such as a two-bitted key lock and a locking mechanism which passes through the steel door and is secured behind the steel door frame. This stack on pistol safe earned the security rating from the California Department of Justice for safe storage of firearms. 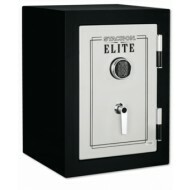 This GCG-500 pistol safe can fit on top of all standard pre-assembled Security Plus Gun Safes. Pre-drilled mounting holes allow for easy attachment to floor, ceiling, wall or other Stack-On pre-assembled gun cabinets. 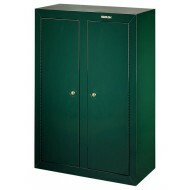 Both the GCB-500 and GCG-500 fit on top of all standard pre-assembled Security Plus Gun Cabinets.